My husband bought me a bunch of tulips for one mothers day, having chosen flowers he thought I would like to paint. First I photographed them from many angles, noticing their details from further away and closer up. I find the closer you look at something the more beauty you can find. 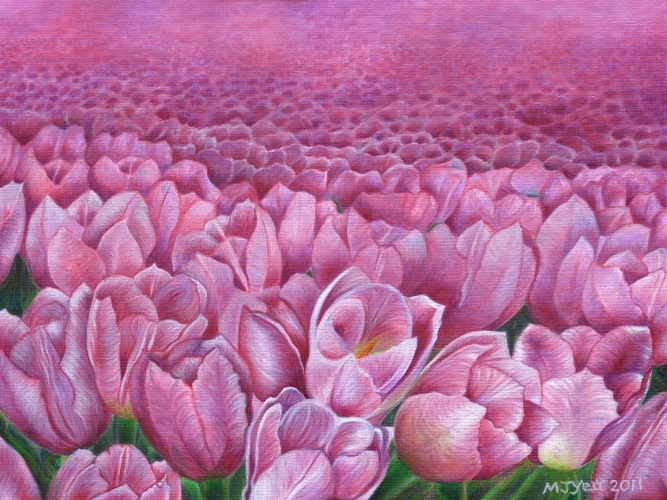 With this painting though, I've tried to combine the beauty of looking at these flowers close up, with the collective beauty of a 'sea' of tulips stretching back into the distance. The further away they become, the more the colour becomes the most important thing, rather than the shapes in the details.